Part of ART CRAWL: Lisa Pijuan-Nomura, Blue Ceiling dance and Angela Blumberg and Jillian Peever bring their imaginative, moving three-part show The Sneak to Hamilton! A sneak peek at three ways of interweaving storytelling and dance, from no words to some words to lots of words, always with vivid, unabashed performances by the dancers. 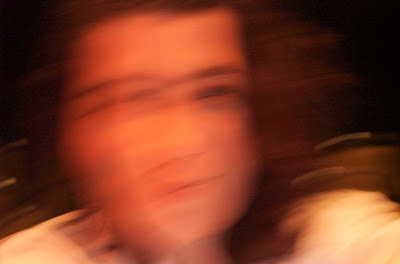 In 2002 I started a performance series called RED:A Night of Live Performance at Toronto’s Lula Lounge. It was a time when i was a dancer and an actor and knew artists from all different worlds. I often wondered why each world lived in a bit of a silo with brilliant artists not knowing other artists, so i wanted to create an event where they could come together, perform a short piece, and meet others who might be interested in collaborating in the future. The event ran for 5 years, and it was such an amazing time. RED hosted over 500 theatre, dance, music, circus, spoken word, comedy and visual artists. We had stunning solos and brilliant group pieces. Every 2 months we would watch a stunning spectacle of talent and art. I always left inspired and hopeful for the world. When i first moved to Hamilton, I felt like I couldn’t do this sort of event here. I didn’t know the arts world well enough to know what would work here. And now, after the past 4 years I have learnt about this community, and have come to the realization that it too needs some sort of place where artists of different disciplines can meet together with themselves and audiences could come together to create stronger bonds in community. I am starting in a small way. Except for Kenneth is a stunning little restaurant on Ottawa St that is full of character. The space holds about 32 audience members with an artistic team of about 8. The first show was sold out and the response was grand. It is my hope to feature some of Hamilton’s finest artists together with artists from surrounding communities. I truly believe that when we meet other creatives then we too are inspired. Come along on Thursday and let me know if you are too. 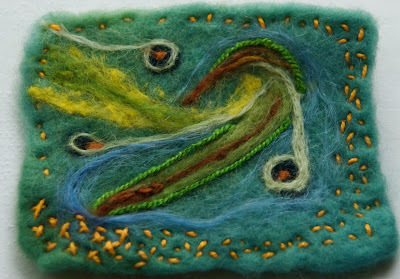 Spent some time in the studio doing some needlefelting. It was so much fun! Sunday we had a small but fun group of people show up for the May Make and Trade at the workroom. If you want to be kept abreast of our happenings, please sign up here! 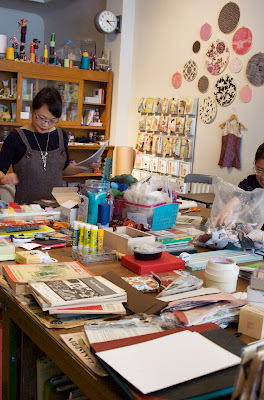 Here the lovely Jinny of Ruby and Apple works on some fabric cards! A photo of me during a rehearsal for the Deep Wireless Festival. It’s one of my favourite fests in the city and i felt so lucky to be a part of the Radio Theatre Ensemble. This time around it featured Francois Girourd, Brandon Labelle, and Jessica Thomson and myself. Two weeks ago, i worked on the Theatre Direct Project for Round Trip Home. What fun! Here is the fruit of our labour! 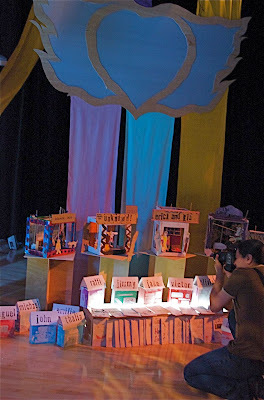 Small toy theatres that the kids created, designed and performed! Of course we started planting our garden. 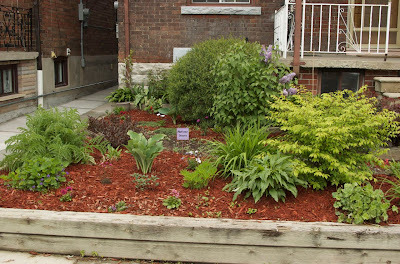 It’s really green this year, but we plan to add more flowers this weekend. Can’t wait! Redness!, originally uploaded by dpnsan. I was thinking about what i was doing this time last year and it occured to me that i was getting ready to present over 150 artists in 4 days for the RED Festival. 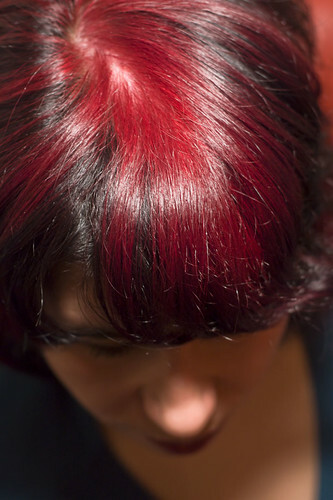 I found this photo that Dave took of my hair and i was aglow in lovely memories of working with Erica K., watching amazing artists and seeing the audiences react to true art. People have asked me how i feel since i closed the RED factory, and honestly, it was so wonderful while it lasted and i learnt so much from those five years, but i am glad. You see, i think that it is a tricky thing to be an artist and to want to also present other artists and to want to bring people together. All of those things fall together and soon you forget about your own art. And well, i think that was what happened with me. While i was presenting everyone else, my art fell by the wayside. A year later, i am slowly creating my own art again and feeling proud of all that i have done. And of course there is the Bread Cabaret that is a much more intimate version of RED that takes much less time to organize. 1. Create something that you believe in and the people will come. Really, it’s true. 2. When you put brilliant artists together in one room, something magical is sure to happen. 3. It’s important not to micro manage people. Let them know that you believe in them, and give them the sky as the limit for what they can create and brilliance will ensue. 4. Drink water and eat well while working hard. 5. Have a sense of humour while working with all people. Us humans are sensitive folks, and sometimes we get nervous about showing our souls…a little laugh will make things feel all right! 11 years, 2 months ago Comments Off on The Bread Cabaret: What a Night! The Bread Cabaret: What a Night! Gurpreet Chana, originally uploaded by dpnsan. And so, as some of you might know, i curate events. And a few years ago i was responsible for curating a very large event in the city. One that become giant and beautiful and brilliant, but just too big for little ole me. And so, i stopped doing that last June, but i missed bringing together different artists, and seeing some of my favourite people in the same room. And so, on February 13, i started the Bread Cabaret at Bread and Circus Cabaret in Kensington Market! 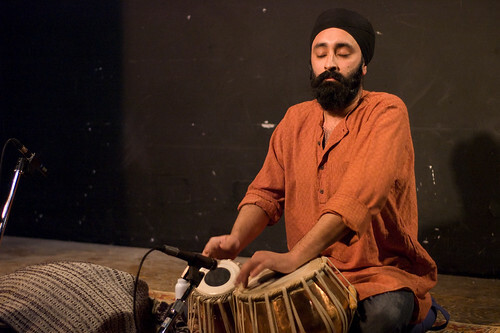 Pictured here is Gurpreet Chana who plays tabla and other percussive instruments. His energy is special and when he plays, audiences listen. Find out more about him here. It was a breathe of fresh air putting together a small group for an intimate audience. The acts were so inspiring. and it didn’t burn me out! In fact, i left inspired! And we sold out!